Statler is Project Manager for Region 1 (read: Multnomah, Clackamas, and Washington counties) of the Oregon Department of Transportation. 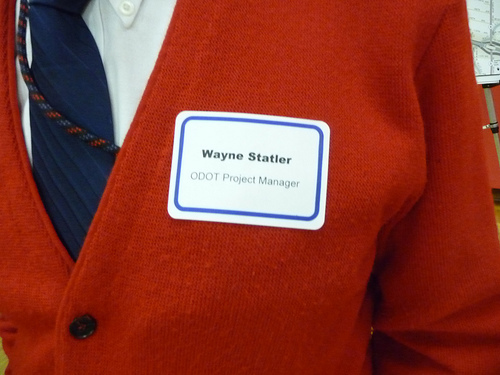 In Part 1 of this interview, Statler discussed the ins and outs of ODOT, his role as Project Manager and what job seekers should and should not do when on the employment hunt. JM: You were talking about how you had four times where you weren’t working. Were those periods in time, periods where you revamped your ten-year vision? WS: No. It’s always been the same vision: construction, project management. One time I was out of work for two years. Two years was tough. That was 1993. The whole economy was down. I came out of the oil industry. JM: You were working in the Middle East. Is that correct? WS: I came back in ’81. I was working in the Middle East, but I was actually down in Texas. JM: What was that like? WS: Texas? Oil industry work? JM: What were you doing? WS: I was project manager. I was cost engineer, then I was a contracts engineer. Worked in refineries, chemical plants, that kind of stuff. JM: Sounds like a hoot. WS: It is. Big money. Money like you can’t believe. Big oil? They are the crookedest bunch of crooks you’ve ever seen in your life. They are aligned with politicians, organized crime…. WS: Fossil fuels are going to be around for a long time, in some form. In some form … if they can’t find them, they will create them. They’re easy to create. You can make oil out of garbage. Problem is it costs more to make oil out of garbage than it does to just find it. The OPEC, when the price of oil went over like $140 a barrel, they were petrified. They were petrified because there are other ways you can make it. And for $140 a barrel, you can make it for less. JM: So it’s like your kitchen scraps. WS: Oh yeah! Organic. So when price went back down to a reasonable level, people went “whew!” In Saudi Arabia they have sand dunes and sand dunes move around. If they want to stabilize a sand dune, they spray it with crude oil. Costs them about 50 or 60 CENTS per barrel to produce them. Cheapest thing around. JM: Do you think that type of behavior is why the reaction to oil spills is so slow? Or is it because we are not prepared? I heard at one point that the reason why the Gulf Coast spill was not acted on promptly was because no one ever thought there would ever be a spill like it. JM: So … why the slow moving? WS: Bureau of Interior – Minerals Management Service. Big Oil has money like you can believe. WS: They have the ability to buy people. [raises his eyebrows] The people who were supposed to be watching the store weren’t because they were bought off. They were bought off with drugs, they were bought off with companions, they were bought off with vacations, all kind of good stuff — bought off with “you treat me right and you have a job,” okay? Every oil well has a blow out preventer on it. Not in the old days. Now days it’s about wasting the oil. JM: It’s about wasting the oil, not about preserving … [laughs] anything…? WS: This blow out preventer they put down there, it hadn’t been checked, the batteries were dead, it was the wrong preventer for the job, on and on and on…. If Minerals Management Services had been even a little bit doing their job, none of this would have happened. BP is like the coal company that had the big disaster. They ignored safety. They were just making money. If you want this to not happen again, it’s very simple. Take the ten top executives of BP and throw them into prison for ten years. It will never happen again. It’s know or should have known. When I worked for the oil company, they were crooks like everyone else. They kind of had this policy: if someone was fired or was stealing from the company then they fired his boss too. I was there one time; someone was stealing from the company. They fired his boss — should have known, why didn’t you take care of it? At the higher levels, the corruption is so unbelievable. There is no amount of fiction that is as fantastic as the truth. WS: When I was in Saudi Arabia they had a big meeting over there. At that time ARAMCO was owned by Mobil, SoCal, Exxon, and I think Chevron. Anyway, we had this meeting. All these executives came in. The wife of the CEO of one of the owner companies wanted to have her hair done. They sent the corporate jet from Saudi Arabia to New York, got her hair dresser, flew him to Saudi Arabia, he did her hair, then they flew him home and the jet came back to Saudi Arabia. What did that cost? Even in those days $50,000. And she thought nothing of it. And neither did he. JM: That’s amazing. [laughs] That’s probably as much money as I’ll make in my lifetime at the rate I’m going. WS: That’s what I’m saying. It is big money. It’s not well audited. It corrupts people. A lot of these oil accidents and so forth, they don’t have to happen. JM: You don’t think they happen intentionally…? WS: No. No. They’re truly accidents. They are accidents of omission. They don’t do the maintenance, they don’t check, they don’t spend the money on this stuff. I’m kind of glad I’m out of the oil business. They are cutthroat. Not as cutthroat as the computer industry, but they’re cutthroat. JM: So what lessons did you take from that and bring here? You had jobs between that and this. Are there jobs that you feel directly apply to where you are now? WS: They all apply, but I have to get a little personal with myself first. I’ve been blessed and cursed with something. Getting and taking the same data, I don’t see the same world that you see. I have to tell you something. I’m not bragging, I just have to put it in perspective. I’m a member of MENSA . I’m a member of the International Society for Philosophic Enquiry. I missed making the Four Nines organization by 1/100th of a percent. JM: What are you doing here? WS: Okay. Just because I have that mental capacity doesn’t give me emotional capacity. Taking the same data that you have, that you see, I will not necessarily come up with the same answer that you do or people in general come up with. I am what I am now with these people as a result of all these other jobs and the corruptions and what I’ve seen and saying I don’t want to do that. Yes, there’s a lot of money, but remember the little script: what good is it if you sell your soul for it. I refuse to sell my soul for the money. Not, do I like to get money? Yes. But I’m not going to sell my soul for it. I worked for a guy one time. Real smart guy. I remember I’d only worked for him for a couple months and we were talking one time and he said, “Oh, I’m not against stealing.” I thought, “Here we go.” He said, “Yeah, five million dollars, upfront, Swiss account. Anything less, don’t talk to me.” I thought, “That works.” Unless you’re going to really make it worth my while, we ain’t doing it for pennies. [laughs] Do I have a price? Sure I do. But it’s not money. If I had a price, it would be along the lines of can I save 10,000 people. Anything less, don’t bother me. JM: You are not drawn in by the golden skeleton in the closet? People are no worse now than they ever were. Really. We talked about volunteering and doing stuff: there’s a story that’s been around forever about after a big storm. The starfish lay up on the beach and this man walks along the beach and throws them back in the water and they say, “You can’t save them all.” And he says, “Well, I saved this one.” That’s what I’m trying to do. I try to tell them the truth. When I look at that group [of people needing employment skills help], some of them it’s … it’s over their head. Some of them are antagonistic. Maybe there’s one or two or three that I’ll touch that cord, give them hope, get them started in another direction. Reviewing resumes, same deal. Is it going to take with all of them? Maybe, maybe not. Maybe one or two. Another lady, she came by herself, she came and we talked about her resume and she said, “You know, I never thought about it this way before.” You know, she sent me an email about two weeks later, she got a job. Did it work? I don’t know, but maybe it did. Essayons. Do you know essayons? It’s the motto of the US Army Corps of Engineers. It’s “Let us try.” Essayons. So many people are suffering. JM: Does that mean that the title of Civil Engineer has more than one meaning? WS: Oh yeah. How many different things do civil engineers do? I’m a rotten civil engineer by the way. Proud of it. What things does a civil engineer do? Well, you can build roads, you can build structures — anything with building. When you get a degree in engineering, it teaches you the jargon, teaches you the basic principles, but what you do with it after that, it’s kind of up to chance or your desire. I don’t do engineering. That’s what I do, but I don’t do engineering. I don’t design anything. I couldn’t design a birdhouse unless I got my books out and studied. That’s not what I want to do. I wanted to manage projects. When I started out, to manage projects was under the civil engineering umbrella. So that’s why I’m a civil engineer twice, and Bachelor’s and Master’s. Also an MBA, because that’s part of being project manager. JM: So it sounds like you are people-centric. WS: Actually, have you head of Myers-Briggs? WS: The first one is Introvert/Extrovert? I score a 10 on Introvert. That’s all the higher you can score. I’m an absolute, flaming introvert. That doesn’t mean I don’t like people. It means after I’ve been around people I have to go off by myself to recover. When I go home at night, I will sit down with a book. I used to sit down with the computer, now I sit down with a book and read, or I’ll go out and work in the garden by myself. Now my wife is there and so forth, but she’s pretty introverted, so we can sit in the same room, reading and not talk and that’s fine for both of us. Do I like people? Yes. I really like them. I’m not cuddly. I’m very leery of real close, buddy-buddy relationships, but I do like them. And I want to truly… not so much now, but back when I was younger there was this thing: Really Caring. “If you really care,” you know. Um, my son has a degree in Psychology. He’s going to go back to school to become a botanist for some reason. Anyway, he’s working in a place called ChristieCare. It’s kind of a transition place for troubled children. He’s pretty good at it. The reason he’s pretty good at it is he doesn’t really care in that sense. He cares enough to help them. It’s like a surgeon. A surgeon has to love you enough to stick a knife in you. That’s kind of one of those psychological things. They have all these rules and regulations. He works a night shift. He kind of does what has to be done. He’s very successful with these kids. Most of the kids he has are in the six- to ten-year-old range. Apparently one time he walked in and there’s this little girl, eight years old, 40 pounds soaking wet, and she was having a tantrum and he’s standing there talking to somebody and this little girl starts beating on him and he just ignored her. Finally she got tired and stopped. He looked down at her and said, “Are you tired now?” She said, “Yeah.” He said, “You want to go to bed?” “Yeah.” And he put her to bed. A couple days later he came home and he had this bracelet, little plastic beads and such. She’d made it for him. The contractors I get along with best are the ones that are older, because we came out of the same realm, the same era, and it’s Wild West. The thing about gunslingers is could they face you down? That’s what they really wanted to achieve. The same with contractors. Can they face me down? Well, they’ve come to the conclusion that they can’t. So we get along. Now, the young ones … different world. WS: Yeah. A guy in here today, he’s got to be 75 at least, maybe older. He’ll come and complain to me about the other project managers, ODOT, all this kind of stuff. We talk and all this kind of stuff. But when it comes down to it, it’s business. We take care of it. JM: Do you think there’s a different motivation behind the younger people? WS: Yes. There’s a different motivation. By the way, different is not a judgment good or bad, it’s just different. My parents, of course, grew up during the Depression. I grew up in the spoiled generation. I’ve had to go through hard times to get rid of being spoiled. The younger people, I find a lot of them really are looking for life, if you would. Unfortunately sometimes it puts them in a position where they can’t experience it. I used to bring on college interns. ODOT has a program where college kids can apply for a position. I used to bring them on for the summer, two or three. One time I had four. I don’t do it anymore. I think it was last year, I had these people applying and … you know, they’d say, “What’s the work?” Well, it’s days, nights, seven-days-a-week general contractor work…. “Well, I can’t do that. I need to get down to the shore on weekends.” or “My wife wouldn’t like that. I’d be away from home at night.” Okay, you do that, but you can’t work for me. WS: Yeah. An expectation of … it’s the old eat to live, live to eat. They’re kind of living to eat. This job is just something that they do so that they can pursue their own hobbies and so forth. JM: They don’t have the passion. I think maybe that’s my assessment of the younger generation. Or maybe that’s always the assessment of the younger generation. JM: Do you think that’s the glamorization in popular culture? JM: That everyone’s supposed to want to be a rock star or a surf bum, these kind of types…? WS: Well, in your head you cannot differentiate between reality and a vivid imagination. There’s no way that your brain can differentiate between the two. So we have television, movies, DVDs, Facebook, electronic media where we have these avatar type programs where you can actually make a persona; Dungeons and Dragons, you take on a persona…. JM: World of Warcraft, all that stuff. WS: Yeah, all that stuff. They are having trouble separating these, in my estimation. I’m no psychologist but…. The things that are important to me are important to fewer and fewer people that I meet that are younger. I have a garden. I grow vegetables, grow lots of flowers, and I go out and look at them, talk to them. There’s Kindle, you can read books electronically. I don’t own a Kindle. When I want to read a book, I get a book, touch it, write in the margins, and underline it. The visions I have in my head I try to formulate based on the reality I experience, not on artificial reality. Now, I’m not telling you to never watch a movie. Don’t get me wrong. But I try to keep it separate. I’m formulating a reality that is extant. JM: So life is not a Bollywood film. WS: Life is not a Bollywood film. JM: People do not break out in song. WS: People do not break out in song. I was in the military once upon a time. Interesting time. They have these cops and robbers movies. They show people with machine guns and the hero miraculously escapes. I tell you, if I have an automatic weapon, you are not going to escape. You are not going to escape unscathed. They show people getting shot and they die. [whispers] They don’t do that! They don’t. They suffer terribly. They may die eventually. It’s terrible. It’s not real. It’s not real. And, by the way, I’m a religious fanatic, so you have to put up with that. But what’s morality? You know? I’ve been married 27 years to this wife — construction is tough on wives. This is number three. We’ve been married 27 years. Is my wife a raving beauty? No, she isn’t. But she’s quiet, she’s clean, she runs the house, she manages the house well. We’re friends. It’s a relationship. It’s not transient. It’s not a one-night stand, if you’ll excuse the crude expression. These people around here, I say they work for me, but we work together. It’s the relationship I have with them, each one of them. It’s a true relationship. I’m, quote, “the boss,” and that poisons it a little bit, but generally it’s a relationship. And, by the way, that’s my wish for you. If you are going to get married, I hope that it is someone who will enter into this relationship with you, recognize you for who you are, and appreciate everyday more who you are. JM: Thank you very much! That’s big. WS: Well, yeah. Like I say, I’m getting into personal philosophy here, but a lot of young people, I don’t see it. I just wonder…. They get married, it’s like an experiment. It’s not an experiment. What is my real objective in life? 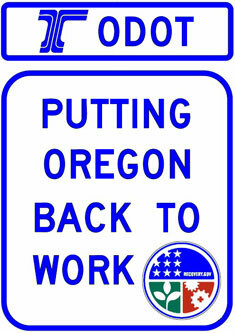 When I finally retire from ODOT, I want to teach school. Teach community college. What’s the secret of teaching? You have to care about the student. Your objective has to be for them to learn. If your objective is to show them how smart you are, stay home. JM: Do you think people know what the right career is for them? WS: Hmmm. Some do, some don’t. I’m not being evasive. I was lucky. What is the right career? Career is when you wake up in the morning and say, “I want to go to work.” And when it gets to be quitting time at the end of the day you say, “Already?” There are a lot of careers. My wife, by the way, has a Bachelor’s and Master’s degree in education. She worked for 15 years before I married her. After our marriage she quit working. We have six children. What is her career? Is it teaching? What about being a mother to six children? Or what she’s doing now, which is a rather complex combination of things? She likes what she’s doing. We have enough to live on; doesn’t bother me that we don’t have two incomes. Like I say, I haven’t missed a meal I didn’t want to. In fact, I should have missed a few I ate. [laughs] So what is a career? It can change. You, for instance, if I had to choose a career for you … you need to do something with language in it. You have a great turn of phrase. Now is that the only career you can have? No. One of my sons, the middle one … by the way, my sons are all much bigger than I am. My middle one is 6’4″, 280. WS: He is a fantastic cook. He is … wow, can he cook. I asked him one time, “Why don’t you become a chef?” He said, “Why should I ruin a good hobby?” Could he make a career of being a chef? Yes. That’s not what he wanted to do. So, does anybody have one career? Now, I don’t have one career. I do this [project management] for money and I love it. JM: You mentioned it’s a hobby people have been willing to pay you to do. So do you think of it as a career? WS: I do. It’s a career. It pays the bills. But I also like to think I have a career of helping people, giving my speech and helping with resumes. Is that a career? Not really — doesn’t pay the bills — but it is something I would like to continue to do. Like go back and teach. Are people one-dimensional? No. Everybody is very complex … simplex, complex, multiplex. Everybody is multiplex. How I am with you is not how I am with someone else. Same with you…. You treat people different ways at different times. You may like me today and be mad at me tomorrow. Who knows? Um, back in the days before there were so many distractions, from say 1900 back to the year zero, there were few distractions. I think people interacted better more. They had time to think and they did think. Euler, the mathematician, as he grew older his eyesight got bad — and he wrote many of his books when he was older — he did the work in his head and dictated to people. Stephen Hawking, he could not pick up his pen and write something. How does he do it? He does it in his head. He has very few distractions. JM: And, it used to be important for people to have interpersonal communities in a very tangible sense … the barn burns down, you have to have your neighbor help rebuild their barn, what if your barn burns down then you need your neighbor to help. People relied on each other more. WS: I come from Pennsylvania. That’s where I grew up. My mother’s families were all Mennonites. Some of my cousins, the ladies, wore the little hats…. Yeah, if the barn burns down, they all go and help rebuild the barn. JM: And there’s no begrudging that the barn burned down. You go and help them. Period. WS: There is so much in the world that is glorious and interesting and fascinating, beautiful and almost all the people are looking at the mud. That’s tragic. JM: It’s hard to not look at the mud. JM: It’s perfect. And the funny is in the heartbreak. It’s not just funny. It’s terrible. The entire time! WS: Of Mice and Men, by Steinbeck. How could a human being write that? Or To Kill a Mockingbird? Oh! Harper Lee wrote one book. [catches his breath] Amazing, Clever things … a little gem. I have six buttons on my radio in my car and sometimes I just turn the radio off and think. It’s the best example I can give you. When I was young — I’m not going to tell you when — people aspired. They tried to wear the best clothes they could. They tried to emulate good manners; Emily Post in the newspaper, that kind of stuff. They pursued these things. If you went to church, and you were a man, you wore a suit. If you were a lady, you wore a dress and hat and gloves. Now the direction seems to be how casual and sloppy can you dress, how crude can your manner be. I’m still of the old school. I’m still…. JM: In your best … with your tie. WS: I think I’m extremely casually dressed. When I go out, generally I’m the best dressed person there. JM: You look like you’re from England, some might think. [laughs] What, are you on vacation? JM: It’s just this outfit. WS: That’s how he dressed. One of my relatives — older fellow, he’s been dead a long time — when he came home he’d take his jacket off, but if somebody rang at the door, he’d put his jacket on before he answered it. I don’t quite go that far. And by the way, if you see me on the weekend, I’ll be in jeans because I’ll be out in the garden. I wear the appropriate clothing for the activity. JM: Does it sadden you that things have changed? JM: We also have the largest park and wetlands. WS: It doesn’t balance. It’s not all there. Those things [beer and strippers] don’t bring happiness to people. When people become things, you know you’ve crossed the line. It’s like some managers. When people become things, they’ve crossed the line. I tell you, there’s no end to managers. I can find you managers. What I can’t find is leaders. Leaders! Back during WWII, there were a lot of leaders that came up. William Slim, he was a Major General in the British army in India. The Japanese were very successful. They landed in Vietnam, they took Singapore, they took Burma, they took Cambodia, and so forth, and they were getting ready to run in and take India. General Slim is the person who commanded the army that stopped them. He was loved by his troops and for a British soldier to love an officer is rare. One of the statements he made, and I have to paraphrase because I can’t remember all the pieces, basically he got his officers and he told them, “You will not eat until your men eat. You will not sit down until your men sit down. You will not sleep until your men sleep. You will not get a clean uniform until your men get clean uniforms. If you do not do this, I will stand you up in front of your troops and break you.” And he meant it. JM: So what are the qualities of a leader? WS: The people cannot become things. Each individual person has to remain a complex individual person with desires, fears, wants, needs … and you have to convince them to do what you want to have done, and they have to like to do it, to want to do it. And maybe they want to do it just because you want them to do it, but they have to do it without your constant supervision. JM: So it’s a way of speaking, persuasion…. JM: So you’re not a leader? WS: I try to be. I try to be…. I had a guy that used to work here. He was only about 6 foot tall but he was about that wide [stretches his arms out]. He used to call me Boss. “Hey Boss.” I hated that. I used to tell him, “Don’t call me boss.” He’d say, “Why not, Boss?” He didn’t understand. He was just doing it, you know … there’s no end of managers. I don’t want to be a manager. I want to be a leader. I like to think this is the best crew in the State of Oregon. Contractors, if they know I’m the project manager, will bid lower. JM: Because you’ve got it so smooth…. WS: No. Because they know they’ll get a fair deal. I’m not going to put something on them that’s not necessary. I’ll cut them a break if they really did their best.